See what’s possible with a little change. Cheerful is a free app that lets you give your spare change to Meals on Wheels of Albuquerque. Link your debit card or bank account and Cheerful will round up your purchases to the nearest dollar, sending the difference to us. You can also set a limit on how much or how little spare change to donate each month! AmazonSmile is the same Amazon you know. Same products, same prices, same service. Sign up and Amazon will donate 0.5% of the price of your eligible purchases to Meals on Wheels. Make sure you’re visiting smile.amazon.com when shopping! Grocery Shop ’til You Drop! Smith’s Inspiring Donations makes fundraising easy by donating to Meals on Wheels of Albuquerque based on the shopping you do every day. Once you link your FREE PlusCard (shopper’s card) card to us, all you have to do is shop at Smith’s and swipe your card! Join BBVA Compass and show your love with a logo debit card! Support Meals on Wheels of Albuquerque, by doing something you do every day—use your debit card for purchases. 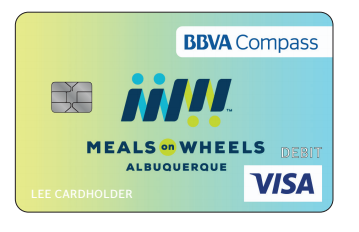 For each qualifying transaction you make with a Meals on Wheels BBVA Compass Visa® Debit Card, we will receive 0.25% of the amount of purchase. The checking account is FREE, and they often run various specials where you can earn free money just for signing up! If you already bank with BBVA Compass, simply tell your banker to update your account with our Affinity Code (listed below). You can also do this by calling 1-800-COMPASS. Save (and give) money doing something we all do anyway – dining out! The Premium Meal Deal is a subscription program that provides as much as $500 in discounts to you each month at over 50 local restaurants, including: Scarpa’s, Arby’s, The Cooperage, Donut Mart, Le Peep, and MORE. Subscriptions start as low as $6/month. $24 of each pre-paid subscription goes back to Meals on Wheels! Sign up for the 12-month plan using our promo code and get an extra month FREE! CLICK HERE to visit the Premium Meal Deal website and sign up.